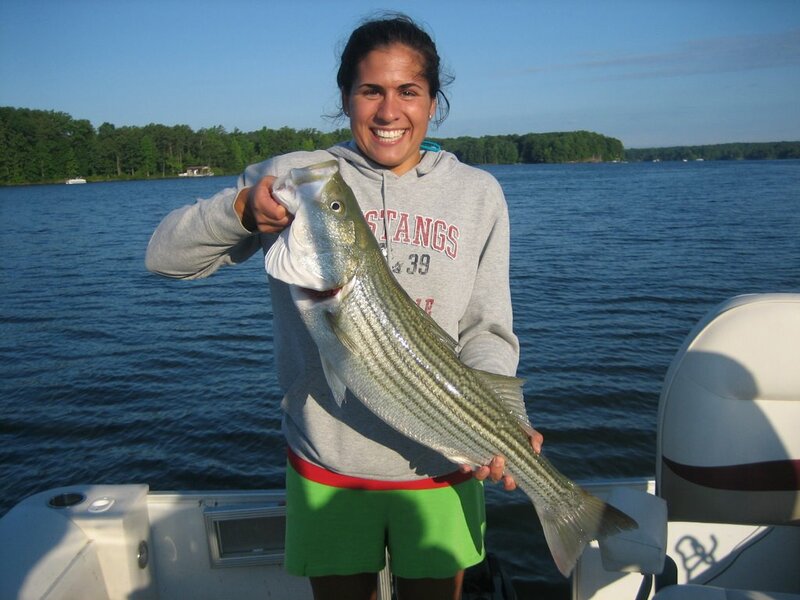 Spring (March and April): Good Chance to catch Trophy Stripers! The fish are shallow and feeding prior to spawn, I run 8 to 10 Water Bugz Planer Boards , a Bobber and a couple downlines at a time rigged with Big Gizzard Shad. 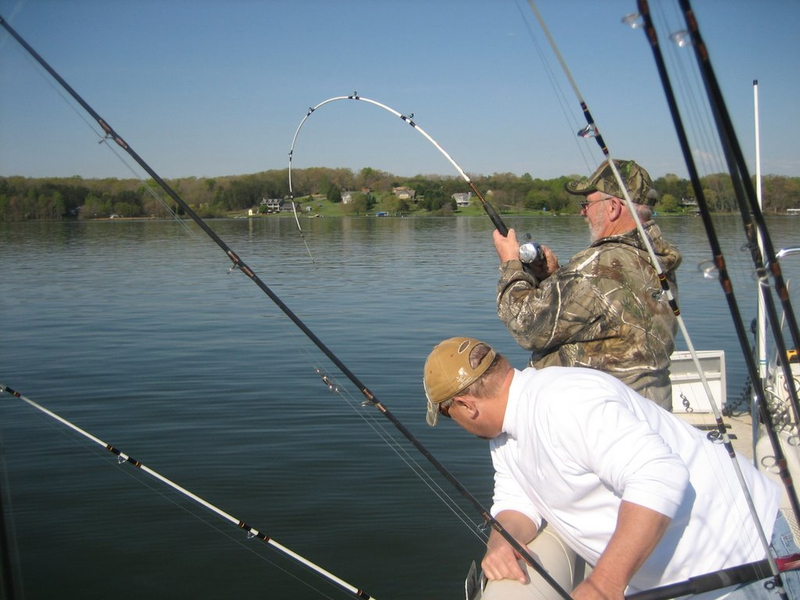 May: This is a transition month where the fish may be shallow early in the month (or day) and deep later in the month (or day). I will employ a combination of techniques to cover as much water as I can, usually 80 yards wide and from top to bottom. This month I run 8 Planer boards and a Bobber to cover the upper water column with 4 or 5 downlines and a couple bottom bouncing rigs , having as many as 15 baits in the water at a time! 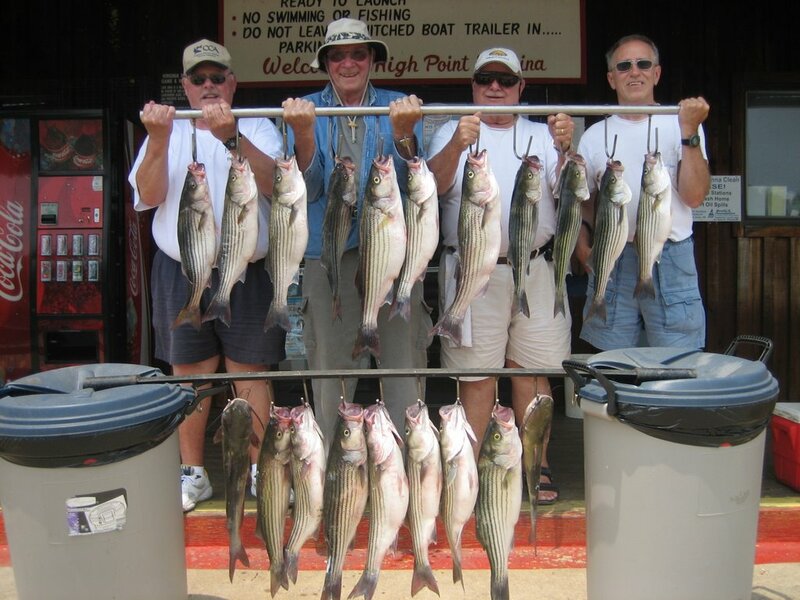 Summer: June and July: Traditionally this has been the best time to catch lots of Stripers ranging from 5 to 10 pounds, many morning catching 50 to 100 Stripers! The fish are deep now and I am running 10 downlines rigged with Blueback Herring simulating a school of baitfish. The action can be fast and furious with every line going down at once. Try to bring at least 4 people this time of year to keep up with the action! This is also a good season for Trolling. Also in July the bait fry moves to the surface in huge schools and in low light conditions there is great topwater action. August and September: The Stripers are trying to beat the heat of the water and transition from extremely deep where it is cooler to shallow where the oxygen may be. In addition to Trolling we convert to running both Herring and Gizzards on downlines when they are deep and Boards when they go shallow. 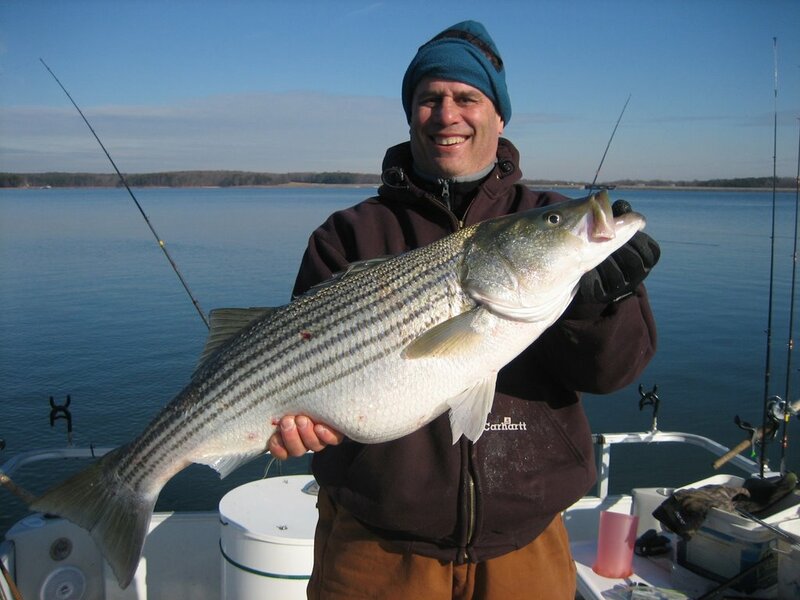 Fall (October and November): Stripers are following schools of baitfish up the creeks and rivers feeding on Big Gizzards and we usually work the upper water column with boards and free lines. 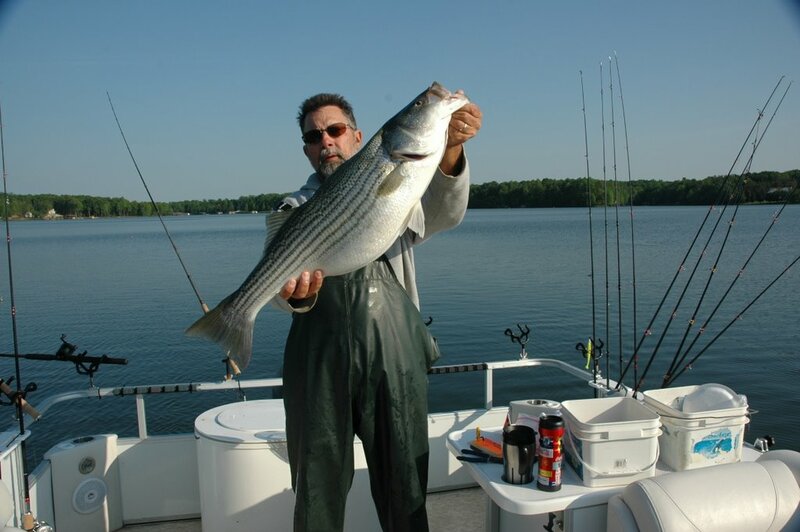 Winter: The Stripers move to main lake areas and are active from the splits down to the dam . We switch back to smaller baits now working them on Boards in the lowlight times and downlines in the bright sunshine. 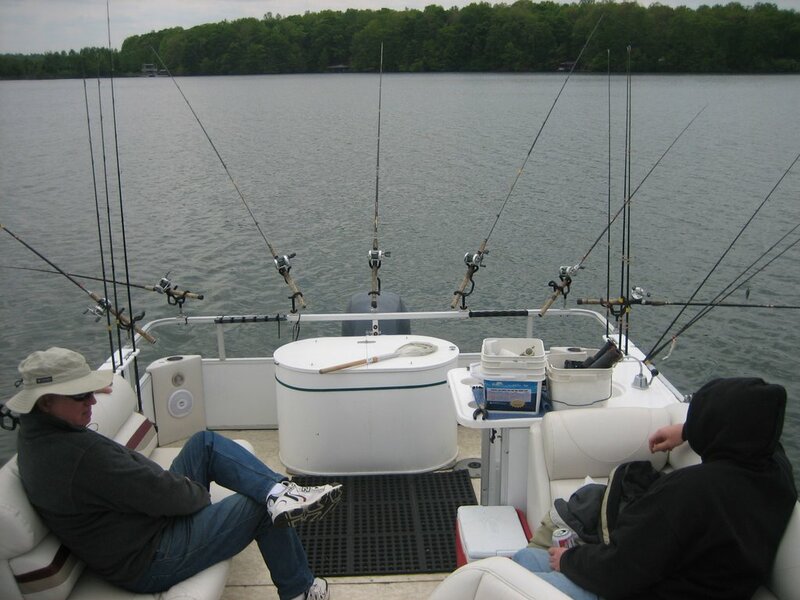 Good time to cast swim baits in the shallows and once locating schools jig spoons and Flukes in their faces . In the winter you never know when the next fish could be a HOG!